Defense Secretary Ash Carter said Wednesday that he was "outraged" by the government demanding some 9,700 soldiers give back the bonuses they received for reenlisting, subsequently suspending the repayment order the same day. 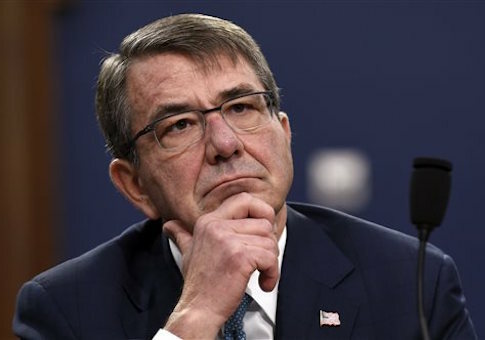 "Well, of course I am outraged," Carter told NBC News "This is a case where we have a trust with the service members who have served us and … we need do justice. And we need to do it fast." After this interview, Carter suspended the order for the California National Guard soldiers to repay their bonuses. "I am ordering a series of steps to ensure fair treatment for thousands of California National Guard soldiers who may have received incentive bonuses and tuition assistance improperly as a result of errors and in some cases criminal behavior by members of the California National Guard," Carter said in a statement. "While some soldiers knew or should have known they were ineligible for benefits they were claiming, many others did not." Carter said he also ordered his office to review the situation and come up with a way resolve these issues by next year. "This process has dragged on too long, for too many service members. Too many cases have languished without action. That's unfair to service members and to taxpayers," Carter added. The California National Guard soldiers in question were given bonuses a decade ago for reenlisting during a time of need, but then the Pentagon said that about 6,500 of them did not actually qualify for the bonuses, NBC News reported. The scandal involving some 9,700 California National Guard soldiers who got the bonuses in 2006 and 2007, when the Bush Administration was struggling to find soldiers to fight the two wars, stoked nationwide outrage after the Los Angeles Times broke the story over the weekend. But the Pentagon determined that a majority of those soldiers, about 6,500, needed to repay the bonuses because they were not actually eligible for them or the paperwork at the time had errors. Carter told NBC News he does not know the extent of the the problem but acknowledged that it could be affecting people outside the state of California. "We are going to do everything we possibly can without waiting for any change in the law [although] there are some legal limitations," Carter said. "We need to do the right thing by our service members–that's the main thing. We also have to do the right thing by the taxpayer. And of course we will." Soldiers have appeared on national networks this week to tell their stories about how they have been financially devastated trying to repay their bonuses. Their stories have caused intense public and congressional backlash against the repayment orders, especially when it came to light the government was charging interest on the repayments. Rep. Jason Chaffetz (R., Utah), chairman of the House Oversight Committee, has said the officials who mismanaged the program should be "held accountable." House Majority Leader Kevin McCarthy (R., Calif.) gave a statement expressing satisfaction with the Pentagon's decision to suspend the repayments. "I am very pleased that the Department of Defense responded to the outcry from Americans across the nation," he said. "As I discussed with the deputy secretary of defense last night, our veterans have already given more than what they owe to this nation, and today's swift action demonstrates that the Department agrees." "While I am happy we were able to work with officials at the Department of Defense to address this issue, we must continue to work to provide a long-term legislative solution so that this never happens again," McCarthy added. Other lawmakers had called on Congress to pass legislation to halt the recovery of the bonuses when they came back in session after the November elections. UPDATE 1:53 P.M.: This post was updated to reflect comment from House Majority Leader Kevin McCarthy. This entry was posted in National Security and tagged Ash Carter, California, Military, Veterans. Bookmark the permalink.